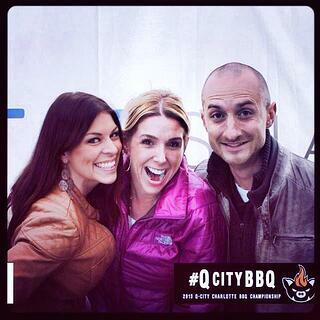 TapSnap franchisees Aleece Kingsley-Taylor (left) and Brian Pisor (right) helped Jennifer Weintraub (center) do the Q-City Charlotte BBQ Championship. An event like that, that typically attracts 100,000 people over two days, would provide incredible exposure. But she was already booked. “We didn’t have enough staff to cover the event from 11am in morning to 11pm at night. And we had another event the same day,” she says. But then she started thinking. While presenting at a September’s TapSnap University about bar and bat mitzvahs, she had meet nearby franchisees Brian Pisor of Grenville, S.C. and Aleece Kingsley-Taylor of Charleston, SC. She asked them if they would like to come help out. For Aleece, it was her first outdoor event. “There were things I hadn’t thought of, like bringing weights to hold down the tent so it doesn’t blow away. And everyone does things differently. You teach yourself, but you can learn a lot from other franchisees." Not only did everyone have a great time with the blues music and sampling some great barbecue turkey, but that one event generated 10 leads for other events. With the franchisees, it turned into a barter deal of goodwill. “Aleece didn’t want me to pay her, but she said I owe her one. So when she wants help, I’ll work for her at an event in Charleston,” says Jennifer. Coincidentally the next day, Jennifer was in a store and met a mother who wanted to book a party in Grenville, so she called Brian and gave him the lead. Another franchisee from the same TapSnap U, Susan Howard of Atlanta, asked if she could come shadow Jennifer at a Bat Mitzvah. “She had never seen one before, so she and her partner came and worked with me at the Mitzvah and learned how it’s done. It’s all about working together. It’s great for me to know that if I have questions about something or need help, there’s a whole network of franchisees out there playing on the same team,” says Jennifer.